Lemax Reindeer Hot Air Balloon animated table piece depicts the flying Father Christmas arriving overhead in a Reindeer themed hot air balloon. Santa has taken an alternative to his sleigh and reindeer to greet all the children in the neighbourhood. Reindeer Hot Air Balloon is decorated with Santa's favourite reindeer as it carries Father Christmas. Lemax Reindeer Hot Air Balloon is an animated table piece with revolving suspended arm suitable for placement in and amongst a seasonal Lemax village Christmas scene. A battery operated Lemax Village collectable table piece which joined the Lemax collection in 2018. 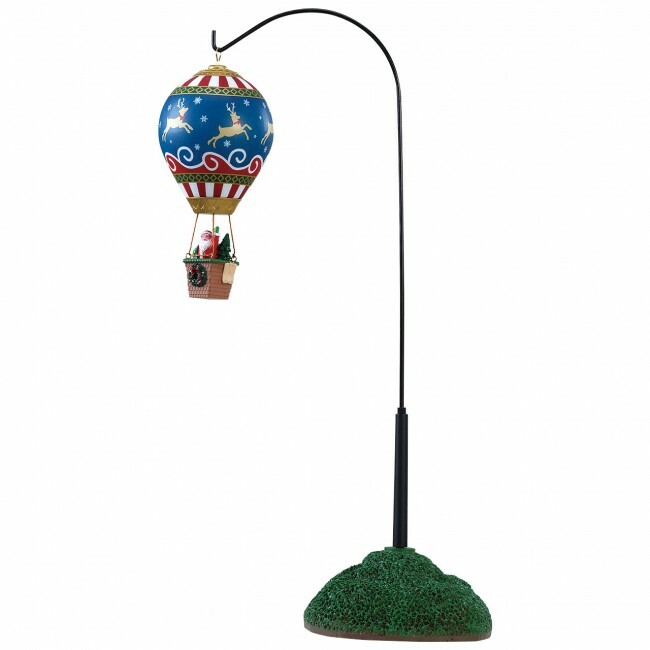 Reindeer Hot Air Balloon offers a magical self standing 37.9cm tall Christmas village table centrepiece. Supplied with arm which rotates above an individual grass hilltop base to compliment your seasonal Lemax Village.